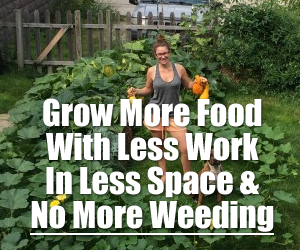 If you think YOU’VE got “limited space” to grow enough of your own food, then it might be time to think again. Not only does he do this on just 3 acres of land, he does it smack bang in the middle of suburbia. 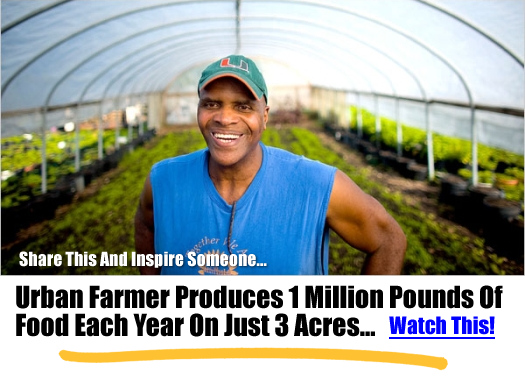 In fact, his well-organized greenhouse system produces a crop value of almost $200,000 per acre. The system he uses mainly relies on the process of Aquaponics – that’s a process whereby you take advantage of the symbiotic cultivation of plants and aquatic animals in a re-circulating system. The fish (which supply you with protein – unless you’re just keeping them as pets) produce a continual supply of natural waste in their water. That water is filtered through “growing beds” which supplies valuable nutrients to the plants, and it’s then circulated back to the fish as freshly filtered clean water. The cycle then continually repeats. You can learn more about Aquaponics here. Maintains 3 acres of land in green houses. Produces 10,000 fish (that’s some serious protein). Uses 300 to 500 yards of high quality worm compost. Makes use of vertical growing techniques to maximize all available space. Runs the system on 1 simple aquaponics pump. Grows food year round by using heat from the compost piles to keep the green houses at a regular temperature even in the middle of winter. …and here’s a 10 min video where he takes a group on a tour of the “Growing Power” facility. You can find out more about setting up your own backyard Aquaponics system here. You can find out more about successful worm composting here. This guy truly deserves that smile on his face! Thank you, kind Sir, for showing us a better way to sustain our healthy lives. Small world thinking. The majority of the world’s population don’t know what an acre or a pound is. Here in New Zealand, nay, here in the rest of the world, apart from the United States and some small country on the side of Indonesia, WE ALL USE METRIC. So for the sake of MOST of the world – an acre is around 4000m2 and a pound is about $2 – may be more or less depending on the exchange rate for each country. Anyway, a million pounds worth of food is a lot, he must be very rich by now. Liberia, Myanmar and the United States are the only countries on the planet still using the archaic imperial system. Visit you’ll find it’s not exactly true.. lots of hype and lots of government grants. Where are you? I wonder how cold it gets where you are. The last I heard Growing Powet is declaring bankruptcy. Yes, Will Allen is stepping down, and the group is shedding employees and under going a massive reorganization, under a debt of ~$500K. They operated at a loss for several years. I’ve always pointed out this wasn’t about production, it was about giving food deserts training and alternatives. With climate change and other threats to conventional agriculture, this kind of thing may become extremely important.